A severe (but unfortunately, not uncommon) case of dental fluorosis is illustrated, showing deep yellow to gray discoloration. Fluoride is a naturally occurring element. In some locations it is found at unusually high concentrations in the water. People who live in those locations may consume inappropriately large doses of fluoride by drinking the water. Teeth which have received excess fluoride during their development may have a blotchy to marbled appearance, with chalky white to brownish spots or streaks. The severity of fluorosis is highly variable. In some cases, it may be noticeable only on close inspection of the teeth. In severe cases, the tooth enamel may be pitted, darkened, and obvious. Usually, the increased enamel density associated with fluorosis helps protect the tooth against cavities, but the condition may be considered visually unappealing by the patient. How does the dentist diagnose Fluorosis? Patients who spent their developmental years (including late fetal development) in an area where high fluoride concentrations were present may have this condition. It is also possible to develop fluorosis by taking inappropriately high doses of a fluoride supplement. Children who live in areas where the water is fluoridated, and who were given supplemental fluoride are at risk for developing fluorosis. Diagnosis is made based on a history of excess fluoride consumption during the formative years of the tooth enamel, and observation of the presence of chalky white to brown stained tooth enamel. All tooth enamel through the second molars is complete by the age of eight or nine. Your dentist can verify the development status of your child’s teeth with two small bitewing X-ray images. The best treatment for fluorosis is prevention. If you have small children, use only a pea-sized drop of fluoride toothpaste when you clean their teeth, and encourage the child not to swallow it. This is especially important if the child mainly drinks fluoridated water. Familiarize yourself with the daily fluoride supplementation schedule recommendations of the Centers for Disease Control and discuss it with your dentist. Fluorosis is generally an issue of cosmetic concern. If there are concerns about the appearance of the teeth, bleaching may or may not be an option. Studies have shown that prolonged bleaching of teeth (daily bleaching for up to several months) can lighten even significant intrinsic stain, including brown fluoride stain; however the safety of prolonged bleaching has not been established, and the practice should not be assumed to be safe. If the fluorosis spots are chalky white, bleaching for a “normal” time period (daily application for about two weeks) may work, although early in the bleaching process the white spots tend to lighten faster than the rest of the tooth, producing even greater contrast. Continued bleaching generally increases the value (whiteness) of the entire tooth, and the appearance will usually become more uniform. There could be safety issues even with “normal” bleaching, and you should familiarize yourself with them and discuss them with your dentist. Another option may be to place veneers on the affected teeth. Enamel microabrasion is likely to remove only superficial stain. Cosmetic bonding with the desired shade of composite resin material is another potential solution. 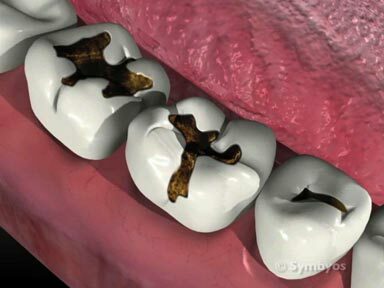 Sometimes isolated areas of discoloration can be treated with a combination of enamel microabrasion and bonding of tooth colored composite resin filling material to cover the stain.